SatTrackCam Leiden (b)log: Defeated by the weather? Just as the, perhaps last, visibility window of the by now world-famous USA 193 (06-057A) is starting here, weather has turned bad. Yesterday evening I could still observe the Keyhole USA 129 (96-072A) and the spent rocket boosters Lacrosse 5r (05-016B) and NOSS 3-4r (07-027B) under already hazy conditions: but now, heavy fog is hiding the skies and all what moves along it. The USA 193 craziness is still continuing. Following the news that it will be shot with a missile somewhere next week - perhaps Wednesday/Thursday night, see also my ongoing updates here - this weblog is attracting an enormous amount of traffic again. Even more than the previous time USA 193 was in the news, late January. Yesterday I was called by a journalist from the NRC, one of the "quality" newspapers of my country. This resulted in a short piece on USA 193, with some mention of our amateur observing work and me, in today's scientific pages. This evening the NOS (our Dutch "BBC") called for a short informative chat, as they might do an item on it the coming days. With all this, I should almost forget to report that I have been observing a lot the past days, taking advantage of three consecutive days of nice clear skies. Targets on these nights were the satellites and rocket bodies mentioned above, especially USA 129. 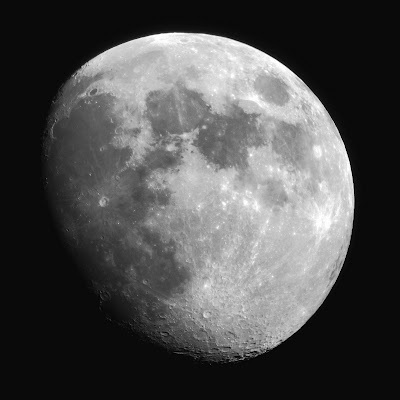 I also experimented further with photographing the moon through my ETX-70, in preparation for the lunar eclipse of coming Wednesday-Thursday night (that I am affraid I am going to lose to fog and/or clouds). With the help of a few euro of hardware I bought at a hardware store on Saturday, I made an extension to my telescope to firmly attach the camera to the eyepiece. Below is one of the results. 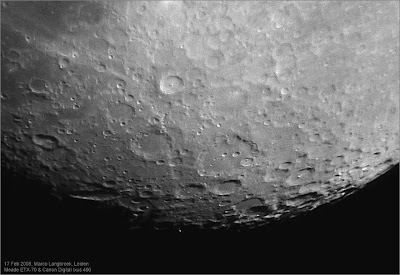 It is a mosaic composite of three images taken in the evening of February 17th. It is 2600 x 2600 pixels wide, 880 kB (click it to see it in full detail).